Peptide (C)KELVKNYNPLER, corresponding to amino acid residues 31-42 of rat nAChRα7 (Accession Q05941). Extracellular, N-terminus. 1,2. Anti-Nicotinic Acetylcholine Receptor α7 (CHRNA7) (extracellular) Antibody (#ANC-007), (1:200). 3,4. Anti-Nicotinic Acetylcholine Receptor α7 (CHRNA7) (extracellular) Antibody, preincubated with the control peptide antigen. Immunohistochemical staining of rat dorsal root ganglion (DRG) frozen sections using Anti-Nicotinic Acetylcholine Receptor α7 (CHRNA7) (extracellular) Antibody (#ANC-007), (1:200). nAChRα7 (red staining) is expressed in DRG neurons. Hoechst 33342 is used as the counterstain (blue). Mouse neuroblastoma × rat glioma hybrid NG108-15 cells (Tanaka, T. et al. (2012) Biochim. Biophys. Acta 1820, 1035.). ___ Cells + Anti-Nicotinic Acetylcholine Receptor α7 (CHRNA7) (extracellular) Antibody (#ANC-007), (1:25) + goat-anti-rabbit-Cy5. Cell surface detection of nAChRα7 in live intact rat PC12 pheochromocytoma cells. 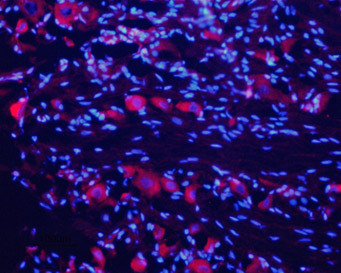 A. Extracellular staining of cells with Anti-Nicotinic Acetylcholine Receptor α7 (CHRNA7) (extracellular) Antibody (#ANC-007), (1:25), followed by goat anti-rabbit-AlexaFluor-594 secondary antibody (red). B. Live view of the cells. C. Merge of A and B.
Karlin, A. et al. (1986) Ann. N.Y. Acad. Sci. 463, 53. Potter, D. et al. (2006) Schizophr. Bull. 32, 692. Haberberger, R.V. et al. (2004) Auton. Neurosci. 113, 32. To date, 17 different but related subunits of nAChRs have been identified and cloned. They consist of a subunits (α1-10), which is responsible for the binding of ligands. In fact, this subunit includes a Cys-loop in the first extracellular domain that is required for agonist binding2. The other subunits responsible for making up the active receptor are the β (β1-4), γ, δ and ε subunits3. Structurally, all subunits have the following: a conserved large extracellular N-terminal domain, 3 conserved transmembrane domains, a variable cytoplasmic loop and a fourth transmembrane domain with a short extracellular C-terminal domain. An active nAChR is generally a heteropentamer (homopentamers also exist) of these various subunits organized around a central pore1. However, the α7 subunit mainly forms homomeric functional structures, although functional channels have been observed with its association with α5, β2 or β3 subunits1. Interestingly, the α7 nAChR is the only subunit to be activated by two endogenous ligands: acetylcholine and choline1. α7 nAChR seems to be involved in the impairment of sensory gating in schizophrenic individuals. Indeed, many polyphormisms have been detected in the gene promoter of the receptor6. There is also an association of the receptor with nociception as it, along with α2 and α10 subunits are expressed in DRGs, the nociceptive center7. Anti-Nicotinic Acetylcholine Receptor α7 (CHRNA7) (extracellular) Antibody (#ANC-007) is a highly specific antibody directed against an epitope of the rat protein. The antibody can be used in western blot, immunohistochemistry, immunocytochemistry, live cell imaging, and indirect flow cytometry applications. It has been designed to recognize nAChRα7 from mouse, rat, and human samples. Mouse neuroblastoma x rat glioma hybrid NG108-15 cells. Tanaka, T. et al. (2012) Biochim. Biophys. Acta 1820, 1035.